We offer a set of Craftsman style landscape tiles in colors of your choosing. The full set consists of six tiles and it may be repeated for longer runs. (But you can order just one or two tiles if you wish.) 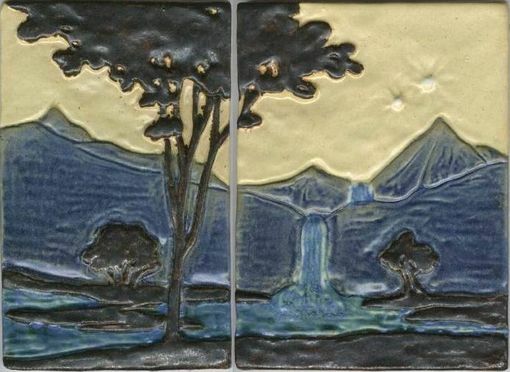 These art tiles look great above a firebox or mantel, over the kitchen sink, or framed on the wall. They are a wonderful accent for a rustic cabin, bungalow, or Craftsman home. Tiles are durable ceramic stoneware, suitable for use indoors or out. Dimensions: These tiles measure approx. 7" high by 4.5" to 5.5" wide each (variable width). 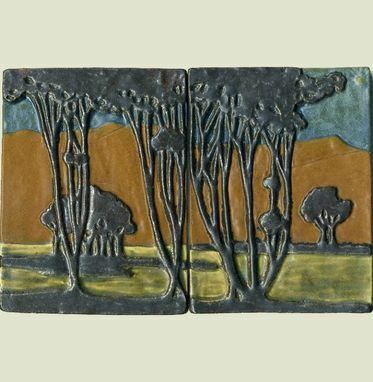 A complete set of six tiles is 7" high by 29.5" wide.